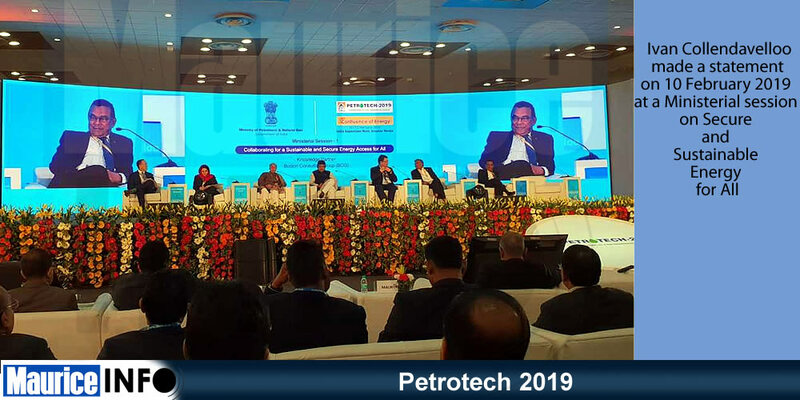 Following an invitation from Hon Dharmendra Pradhan, Minister of Petroleum and Natural Gas of India, Ivan Collendavelloo, has attended the PetroTech 2019 Conference in India from 10 to 12 February 2019. The Deputy Prime Minister made a statement on 10 February 2019 at a Ministerial session on Secure and Sustainable Energy for All. On 11 February, the Hon Prime Minister of India Narendra Modi made an inaugural speech at the conference. The Petrotech is held every two years and provides an opportunity to share the latest technologies on oil & gas industry. The event aims to explore areas of growth in petroleum and natural gas and LNG.